The Ultimate Guide to Saigon S..
Only have 24 hours in New Orleans? Not to worry — you can still let the good times roll despite the ticking clock. The spotlight is on the touristy neighborhood known as The French Quarter, purely because of time constraint. Before you dismiss Bourbon Street, know there are things to do beyond drinking Hand Grenades and catching Mardi Gras beads. Read on for some culture served with a side of fun. Laissez les bons temps rouler! Take it easy in the Big Easy with a cup of cafe au lait at the world-renowned Cafe Du Monde . The original French Market coffee stand, with its open-air seating, operates 24 hours a day, seven days a week (with the exception of Christmas Day). The coffee is spiked with ground chicory root, a strong flavor that was introduced as a coffee substitute by the French. Cafe au lait is chicory coffee with scalding hot milk. During the hot and humid summer months, you can opt for an iced coffee instead. Nothing pairs better with their signature brew than their beignets, square nuggets of fried dough covered in generous amounts of powdered sugar. One order = three beignets. Also, do not wear black if you’re trying to take pictures as the sugar gets on everything. There are usually two lines: one for take-out and another to sit-down, the former being significantly shorter than the other. But in my personal opinion, dining in is half of the fun as you’ll be surrounded by the excited chatter of first-time beignet eaters. For the most part, the seating turnover rate is quite high so don’t lose heart if that line looks long. Not enough time during the day? Try going late at night, as in right before you head home and are in need of a sobering snack. Better yet, get a mid-evening coffee at 2 am to keep the party going. From Cafe Du Monde, cross the street and take a stroll through Jackson Square, a public garden featuring an animated statue of the 7th President of the USA, Andrew Jackson, saluting passersby. Jackson Square and neighboring St. Louis Cathedral have both gone down in American history as significant historic landmarks. In 1803, the Louisiana Purchase was signed in Jackson Square, marking the largest territorial gain in the history of the United States. The triple-steepled white cathedral is the oldest continuously operating Catholic church in the USA. Around the outer perimeter of Jackson Square’s fenceposts, you’ll see artists of all professions—muralists, musicians, tap dancers, psychics—peddling their various talents to tourists. If you are looking to purchase artwork, bring some cash to ensure fair trade between you and the independent seller. Tips: look down to find out what street your on. Every street name in Nola is spelled out in blue and white tiles found on each street corner. You can encounter spirits from the world beyond in almost every corner of America’s most haunted city, including the dining table. With its wraparound balconies overlooking the lively Jackson Square, Muriel’s is home to fantastic Creole fare, as well as a restless ghost who haunts the Séance Lounge on the second floor. Story goes that the building’s former owner, Pierre Antoine Lepardi Jourdan, had killed himself after losing his beloved home in a poker match. He has refused to leave Muriel’s since. But it’s hard to pay attention to ghost stories when chowing down on jampacked po’boys, the standard N’awlins sandwich made with French bread, lettuce, pickles, tomatoes, and either fried seafood or roast beef. I was also encouraged to try Turtle Soup, a Creole classic made with snapping turtle meat and brightened with a touch of Sherry. Along with the beguiling ghost story and delicious food, it’s hard to ignore the elegance of the restaurant. Muriel’s decor continues to live in the 18th-century, with its ornate wallpaper, paintings of bygone gentry, and lavish furniture. After lunch, head upstairs to the Séance Lounge for some Sazarecs (the city’s official cocktail) and if you’re feeling lucky, maybe Monsieur Jourdan will join your round of drinks. Activities: The 4-in-1 Voodoo, Ghost, Vampires and Witches Tour by Witches Brew Tours. Book here. While parades and public drinking go-hand-in-hand, they can get a bit tired so if you want some more novelty, visit the Carousel Bar , located in the Hotel Monteleone, and give the rotating bar a whirl. This adult playground features a merry-go-round converted into a revolving drinkery. Every 15 minutes, the counter goes for a spin. Ask for the Vieux Carre, the hotel’s signature drink featuring cognac, rye whiskey, sweet vermouth, Benedictine liqueur, and a mix of Angostura and Peychaud’s bitters. The seats might be overrun with tourists but it’s still a unique experience. While tours may not be everyone’s favorite thing, they allow you to get to know a city better in a short amount of time. Luckily, there’s a darker side of New Orleans to explore with supernatural tours in spades. Join the entertaining Voodoo, Ghosts, Vampires, and Witches Tour for a lowdown on the French Quarter’s haunted happenings. 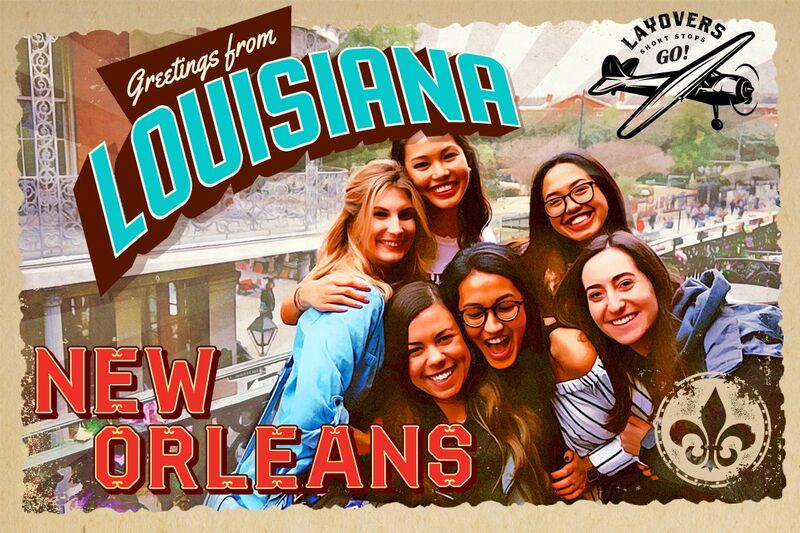 The tour kicks off at The Pharmacy Museum, goes through a Nola love story gone wrong, gives tidbits about local legends, voodoo queen Marie Laveau and the “real” vampire Jacques St. Germain, and finishes at the infamously grim LaLaurie Mansion. You don’t have to be a believer to get a thrill out of this 2-hr chilling history lesson. Looking for voodoo dolls? Look no further than Reverend Zombies House of Voodoo. In a nutshell: Eat at the shops that started culinary traditions in the Big Easy. “New Orleans food is as delicious as the less criminal forms of sin.” Mark Twain said it best. In a city known for its vices, gluttons beware. The temptations for dinner range from the salty-delicious muffalettas to bowls of bubbling gumbo. If you’re not feeling fancy, head on over to Central Grocery & Deli , the birthplace of the muffaletta, America’s most savory sandwich. Packed tightly between Sicilian muffaletta bread, you get two types of cold cuts—salami and capicola; two types of cheese—provolone and mortadella; and a whole lot of olive salad to hold everything in place. One sandwich can be split between four people and costs $20. For those wanting a sit down meal, try Gumbo Shop , a 50-year-old restaurant with two charming seating areas to choose from. Opt for the more relaxed courtyard seating or for a more stimulating dinner experience, take a seat in the massive dining room with its gigantic murals paying homage to New Orleans’ fascinating history. Between the Chicken Andouille and Seafood Okra gumbo, the Chicken Andouille had a more balanced roux base. Make sure to leave room for dessert. Brennan’s is known for the invention of Bananas Foster, a decadent dessert made with caramelized bananas, browned in a pool of sugar, cinnamon, and butter. It’s then soaked in banana liquer and rum before being set aflame. A scoop of vanilla ice cream finishes the masterpiece. Bon Appétit! Gumbo made with meat is traditionally Cajun, while seafood is a Creole take. Gumbo Shop has both. Want a crash course on New Orleans food? Take a 10-minute ride to St. Roch Market in The Marigny to sample all of Nola’s culinary heavyhitters, all under one roof. From the city’s quintessential Creole fare like crawfish etouffee and jambalaya, to foreign imports like Haitian and Egyptian cuisine, it is a destination for the culinary curious. During Mardi Gras, order a King Cake latte, a caffeinated interpretation of the Fat Tuesday food tradition. If you need a more expansive guide on Where To Eat in New Orleans, read this post by There She Goes Again. In a nutshell: Welcome to New Orleans, where the party never ends. You’ve made it to nightfall and the fun has only just begun. Raucous bachelor(ette) crews, the bacchanalia of Mardi Gras, and its title as the birthplace of jazz makes New Orleans the ideal place to get your party started. Thanks to the city’s lenient open-container laws, you can take the party outside of the clubs and bars. If you’re sticking to Bourbon Street , your first stop should be Tropical Isle , the only licensed-seller of the Hand Grenade. The Hand Grenade is a deceivingly deadly mixed drink served in a neon green half-yard vessel and is touted by all the tourists. But if you want to ramp up the ‘WOW’ factor, order a “Shark Attack” at the bar. Trust me. Places to have a blast include Razzoo , The Krazy Korner , Oz , and for some decent jazz and a nightly burlesque show, check out Irvin Mayfield’s Jazz Playhouse . If the frat party vibes of Bourbon Street fail to impress, travel to Frenchmen Street , where the locals-approved music scene feels more in tune to the soulful spirit of the city. It truly is a mecca for music-lovers who want to be exposed to fresh, raw talent. The Spotted Cat , The Maison , d.b.a , Cafe Negril , and Snug Harbor are just a few handpicked selections in a sea of great entertainment venues. Hand grenades are one of the many iconic New Orleans cocktails and they are potent! The best way to get around New Orleans is by Uber or Lyft. This is only place in the world I’ve encountered consecutively kind and gregarious Uber/Lyft drivers. When going back to my Airbnb late at night (and once, by myself), my driver was a gentleman and ensured I got inside safely before he drove off. It seems that these ride sharing platforms have had a really positive impact on the community, giving naturally sociable and hospitable locals a way to make some extra cash while acting as natural tour guides. On the otherhand, while Airbnb is great cheap option for groups, its presence has been very problematic in the city. We stayed at an Airbnb “shotgun house” rental in The Marigny, which was spacious and super affordable for our group of 12, but one of our Airbnb driver’s shared that the neighborhood we were in was “not the best.” The next time I visit, I’ll probably splurge for a boutique hotel. AND HERE’S A MAP OF ALL THE POINTS OF INTEREST!  Is there anything you would recommend if you only had 24 hours in New Orleans? Share the wealth in the comments below.